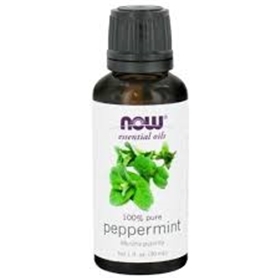 NOW Peppermint Oil - 1 oz. The health benefits of peppermint oil include its ability to treat indigestion, respiratory problems, headache, nausea, fever, stomach and bowel spasms, as well as for pain relief. Peppermint oil is very helpful as an aid for digestion. People often put a few drops of peppermint oil in a glass of water and drink it after their meal for its beneficial digestive properties. It is carminative and therefore helps in removing excess gas. Peppermint oil is a good home remedy for nausea and headaches. To quickly alleviate the pain of a headache, simply apply peppermint oil in a diluted form directly on the forehead. Inhaling peppermint oil can eliminate the effects of nausea and motion sickness. Menthol, which is abundantly present in peppermint oil, helps to clear the respiratory tract. It is also an effective expectorant and therefore provides instantaneous, though temporary, relief for numerous respiratory problems including nasal congestion, sinusitis, asthma, bronchitis, cold and cough. As a result, it is used in numerous cold rubs and balms. When these cold rubs are applied to the chest, they can quickly remove nasal and respiratory congestion. Peppermint oil has proven to be antispasmodic, expectorant, and anti-inflammatory in nature, and is highly respected for its use in relieving respiratory issues. ALWAYS DILUTE BEFORE ANY USE OTHER THAN AROMATHERAPY. KEEP OUT OF REACH OF CHILDREN. AVOID CONTACT WITH EYES. IF PREGNANT OR LACTATING, CONSULT A PRACTITIONER BEFORE USE.